ShortScale :: View topic - Should I buy a new interface, a 4 track, or both? 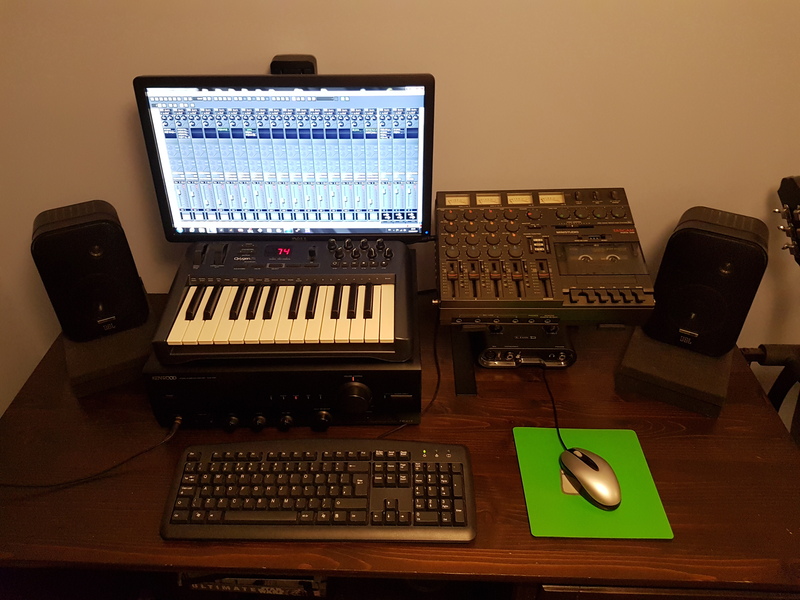 Posted: Wed Feb 28, 2018 10:53 pm Post subject: Should I buy a new interface, a 4 track, or both? I was listening to some demos I did about 20 years ago on a Tascam 414. They sound pretty good overall, and I remember having a lot of fun using the 4 track. I find that limitations actually help me during the recording process. I currently have an Apogee Jam interface, so I could mix down a 4 track recording to a DAW pretty easily. However, on a certain level I feel that a 4 track might be too limiting. I've also been looking at the Behringer UMC404HD interface. It has 4 preamps and is only $100. It's received really good reviews online. Drivers won't be an issue because I have a MacBook. My only real concerns are latency and getting bogged down whilst tracking and mixing on a DAW. Any thoughts on the matter? I have half a mind to just buy a cheap 414 on eBay and buy the Behringer too. Tascam were loads of fun, I miss those days. Gonna buy one again if I get the chance. They made you work harder as a musician. No poncing about editing stuff. Like Doog and them. No srsly, Doog knows his onions with this kind of thing. He is the man to ask. Most cassette 4 tracks were designed to be used with type II (chrome) cassettes. I don’t think anyone still makes type II cassettes and second hand prices on eBay for sealed TDK SA/SA-X etc have gone a bit nuts. They’ll obviously work with cheap type I cassettes but might not sound quite as good as you remember. I know what you mean about limitations sometimes helping you be more productive but I always found 4 tracks too limiting (6 seemed to be what I always needed when I was recording to 4 track). If you want to get away from using a PC, have you considered a standalone digital multitrack? Boss made some decent ones and you should be able to pick one up pretty cheaply second hand. I have fond memories of both my Fostex cassette 4 track and my Boss BR-1180CD but tbh I don’t think I’d want to swap the flexibility of Reaper to go back to them full time. They made you work harder as a musician. No poncing about editing stuff. Like Doog and them. I have a friend who does crazy amounts of songwriting and recording with a simple macbook garageband + USB microphone and apogee Jam guitar input. I on the other hand have a tascam multi rack interface with a million ins and outs and a basement full of decent gear to record through it and I feel kinda bogged down by that setup. I kinda miss my old BR864. Well you know I love my porta one - but I don't think I'd want it as my only option, using it to bounce in and out of the computer is the best use in my opinion. It definitely imparts a sound you don't get from a DAW and if you get one with a pitch control there's plenty of warping fun to be had. As for tapes you can still get good chrome type ii tapes easily enough I just bought a pack of two c90s for £10 so at 45 minutes each they'll do me for a while. I just bought a Korg nanokontrol (not pictured) to get away from mixing with the mouse and I recommend that. Yes, the Apogee Jam + Garageband has proven to be a really inspiring combination for me as well. No fuss, just get things done quickly. However, I'm now wanting to record multiple tracks at once. I'm still using the Submarine Pickup to get bass tones while playing guitar, and I've added a nifty hardware drum machine. I'm starting to think Dez is right. A cassette recorder would be much better with a computer interface. My old 4 track demos certainly have more warmth and character than my Garageband or Pro Tools stuff, but the mixes are pretty damn awful. A basic limiter and a parametric EQ would have helped significantly. So perhaps I should start with a 4 track, record and do a basic mix on tape, then transfer each track independently to a DAW using the Behringer interface or another with 4 preamps. Because it's going to go in the computer one way or another at some point. I could add more tracks direct to digital if needed. Thanks for the feedback guyz. I wonder if Doog might chime in? Also: I did find Type II cassettes for about $7.50 each. I think I can do better if I internet harder. If you want to get away from using a PC, have you considered a standalone digital multitrack? I was looking pretty hard at the Zoom R16 for a moment, but the instruction manual has 100 pages! As for tapes you can still get good chrome type ii tapes easily enough I just bought a pack of two c90s for £10 so at 45 minutes each they'll do me for a while. I am probably being a bit tight and not eBaying hard enough. I always used to use SA-X60s back in the day, think I'd read somewhere that 60 minute tapes were more reliable than 90 minutes ones or some such probable nonsense, and my Fostex runs at high speed so I only get 15 minutes out of a 60 minute cassette. When I did do a bit of a hunt for blank cassettes a while back, people seemed to be asking >£10 for SA-X cassettes, which seemed a bit excessive to me. How do you find that Dez? I've been looking for some sort of controller for a while so that recording/mixing feels less like work. I spend much of my day sat in front of a PC and find it uninspiring to do so again in the evening to record stuff. with Garageband or similar you can do loads of stuff in the DAW for guitars/bass if you don't want to mic an amp up for whatever reason. I'd go interface and DAW, because it can be as simple or complicated as you want. I was writing and demoing a song for the above competition (that I did not win), I literally programmed drums, bass and brass in Garageband and used the crummy internal mic on the Macbook for acoustic and vocals. I've not written and recorded as fluidly in YEARS as I did then, because my toolset was so limited, I was focussing on the material, not the sounds. Always used c90s even back in the day never had a problem. Nanokontrol is pretty good only had it a few days but it's pretty slick there's a software editor to configure it momentary/ toggle on the buttons and what not. Looking at configuring on of the buttons to change midi channels so I can have two levels of the 8 faders giving me 16 track mixing - don't think I'd need more than that. OK, I'm convinced. Interface it is. I wonder if I could find a good interface with faders a la the Digi 002? Solid logic. I feel I was the most creative and most productive using the Apogee Jam with an iPad. I think Garageband is great because of the inherent limitations. However, I'm ready for more inputs and a larger screen.